News, announcements, and topics related to teaching projects and events at Clark College in Vancouver, Washington. The following video is for Clark College’s HTML Fundamentals Class and covers the basics of HTML and CSS you need to know for building and fixing web pages. It also applies to understanding the underlying architecture for WordPress Themes. 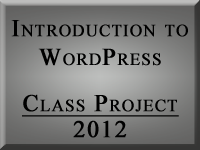 The first Introduction to WordPress Class starts tomorrow at Clark College. If you are registered, read Preparations for the Clark College Introduction to WordPress and Introduction to WordPress Class 1: Getting Started to get ready! See you then.